Toronto, June 16, 2015 – In partnership with Canadian Feed The Children (CFTC), CEDO Uganda led a commemoration of the Day of the African Child on June 16th under the theme: 25 Years After the Adoption of the African Children’s Charter: Accelerating our Collective Efforts to End Child Marriage in Africa. The event brought the district local government, civil society organizations, schools, activists, community members and children together to make their voices heard against child marriages in Uganda. As a member of a national and global alliance Girls Not Brides, this year’s theme was particularly relevant to CEDO’s work in ensuring the eradication of child marriage in Uganda and in other parts of the world. 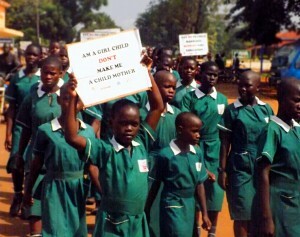 Uganda ranks among the top two countries, second only to Malawi in Africa, in rates of child marriage. Uganda also falls among the 11 worst African countries with high numbers of child brides (an estimated 40-46% underage girls below 18) who are forced or lured into marriage. Globally, the UN predicts that child marriage will lead to more than 140 million girls being married off by 2020 if allowed to continue at the current rate. CEDO urges joint effort between state and non-state actors, and emphasizes the importance of empowering children to be involved in the discussions related to child marriage. During the commemoration, CEDO invited a youth speaker, Alinda Mercy, age 12 and a student at Masindi Public School, to provide a statement against child marriage in Uganda to all in attendance. Moving forward, CEDO has reaffirmed their commitment to end child marriage in five districts in Uganda by raising awareness among children, parents, religious, and cultural leaders on the harmful effects of child marriage. The Day of the African Child is commemorated every year on June 16th by member states of the African Union and its partners, and is primarily a commemoration to recall the 1976 uprising in South Africa when a protest by school children against apartheid-inspired education resulted in the killing of unarmed, peaceful young protesters by police. Today, it serves as a reminder for governments, international institutions, and communities to renew their ongoing commitments towards improving the plight of children.